The Video Rental Store was one iteration of Under New Management. Under New Management is a co curatorial collective of Suzanne Carte and Su-Ying Lee and the title of an exhibition that took place in a storefront in 2010. More about the exhibition Under New Management here. In 2018 Video Rental Store will be shown at SAW Gallery, Ottawa. Would you like to submit to the Video Rental Store? View call for submissions here. 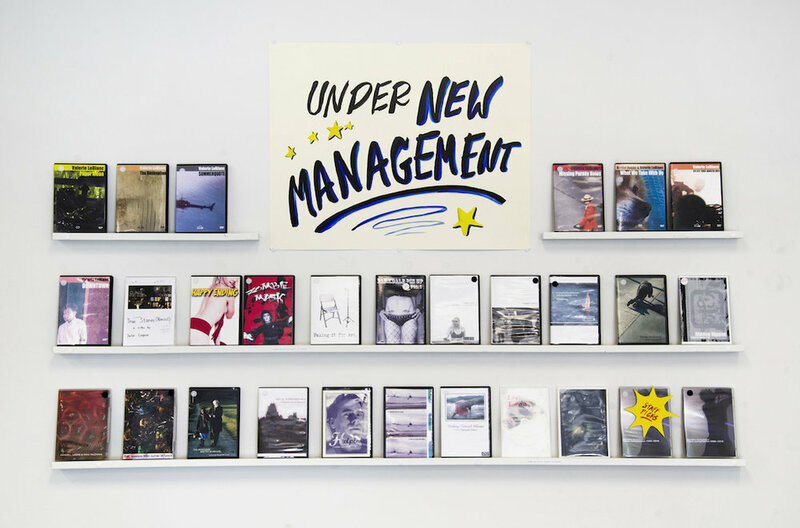 Under New Management: Video Rental Store is an exhibition that takes the form of a video rental store. Rather than offering popular entertainment, the store lends out artistsʼ videos. The project employs the familiarity of the retail environment to connect to a broad audience while, repositioning the gallery’s intermediary role. The Video Rental Store positions the gallery as a conduit, giving viewers direct access to art, rather than limiting the space of engagement to the area within the gallery walls. We are currently on the cusp of the dematerialization of the video rental business. Large corporate chains and family run businesses have shared in the same fate. The most unfortunate loss is that of the local independent operation that carried rare titles, cult favorites, documentaries, sections devoted to directors, experimental films, and foreign titles. Under New Management: Video Rental Store provides audiences easy access to content that is not produced strictly by Hollywood blockbuster aspirations. The roles of artist, curator and audience can also be understood as akin to that of producer and consumer – terms that are typically applied to economics rather than to contemporary art and its audience. Under New Management employs this in an explicit manner to acknowledge that while cultural production is a mode of production with its own language and specificities, is not apart from or outside such systems. All titles are artist's videos taken from an open call for submissions. All work submitted is accepted unless identified as having racist, misogynist or homophobic content. Rentals are on the honour system basis. No membership or deposit is required. When the rental is returned, the customer is asked to pay-what-you-wish. We request a payment that reflects the viewer's experience or appreciation of the work. Non monetary payment is preferred. Examples of this type of payment have included books, crafts, DVDs and notes. All payments received are mailed to the artists.